Beautiful adobe home that sleeps 6 (10 if you add Casita). This quintessential double-walled adobe home is located at the end of a secluded dead-end street. The house has 3 large bedrooms each with its own bathroom and fireplace. The outdoor space has beautiful gardens and views to the mountains. Gaze at the stars while sitting outside in the gardens and you'll know why we named the home Casa Nova. This is a real oasis located about 1/2 way between the Plaza and Museum Hill on the historic east side. It's only a 10 to 15 minute walk to lower Canyon Road where the majority of Santa Fe's many art galleries are located. This is a unique and beautiful home with historic significance. It is tastefully decorated and has an open feel with the touches that are typical of older adobe homes like plaster walls, nichos, wooden-beamed ceilings and a kiva fireplace in every room. The main dining room table seats 8 people comfortably and there are additional outdoor dining areas on the portal and in the garden. You will have a feeling of old Santa Fe, but the home has all the modern conveniences as the result of an extensive remodel in 2011. The beds and linens are top quality and new. All of the appliances are new and the home has all the amenities like wireless internet and premium cable TV. The home decor is a blend of our Southwest roots (I'm from California and Jane is from south Texas). Many things come Thailand where I work as a geologist and we lived until late 2017. Jane is an artist and most of the artwork on the walls are naturally her own. The home is comfortable in all seasons with radiant heating and evaporative cooling (for a touch of humidity). This house is a unique property in the heart of Santa Fe's Historic Eastside. We are proud to share this home and know you'll like it as much as we do. If you would like to include the optional 2 bedroom Casita, please see HomeAway listing *910740 for details and photos. 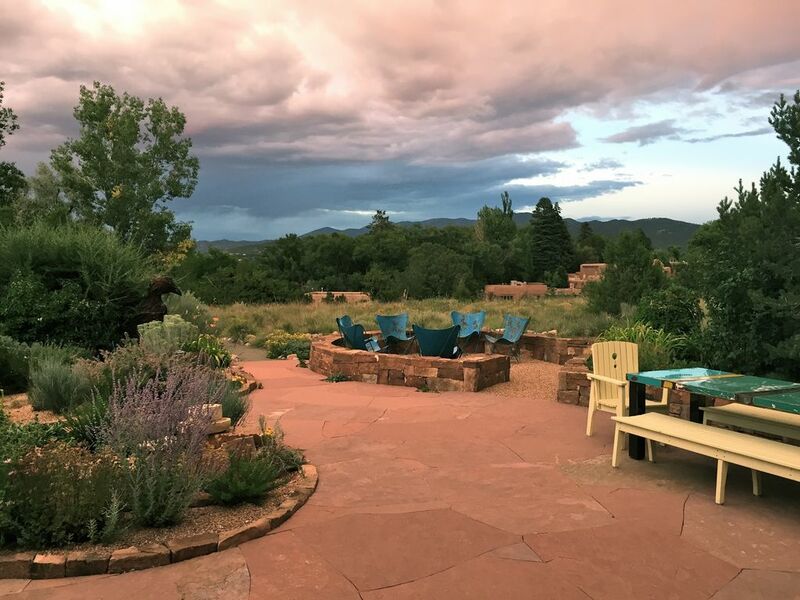 We are two new "empty nesters" looking forward to living permanently in our Santa Fe home. For the next few years we will open up our house to guests during the times we can't be there ourselves. We've recently returned to the USA after living in Thailand for almost 11 years and we're excited to be closer to family and friends. It's simply a beautiful and peaceful home, comfortable and unpretentious. It blends into its surroundings. Close proximity to downtown, but spacious and private. Casita bathroom access (4th bath) is only accessible from the twin-bed bedroom. Fully furnished 3 bdrm main house and/or 2 bdrm Casita. Did you ever visit a hotel/place/VRBO and it is so much better than you ever imagined. We felt that way at this beautifully appointed, well located house. This is a house where every piece of furniture and art were thoughtfully selected by the owners who have great taste. If I'm back in Santa Fe, this is the place I would want to stay. PS. We didn't need to rent the casita in the rear, but looked through the windows. It would be just perfect for three to four people. Also, a great house for a family getaway if you book both the main house and the casita. Thank you for a great vacation experience. Casa Nova was the perfect place to stay. Close to the Plaza. We would stay there again. Extreme care has been taken for every detail. We enjoyed sitting outside, looking at the flowers, plants, and hummingbirds. The only drawback was the face that we had to through one of the two casita bedrooms to get to the bathroom. Going back to the casita, it is bigger than it looks in the photos. There is the main bedroom with wonderful view and fire place, a living room/kitchen & another fireplace, a 2nd bedroom with twin beds, a full bath, and a large laundry room. I accessed the casita through the house & garage, but it has its own entry way and private patio. The big house has a large and comfortable living room. We spent a lot of time there. We also did quite a bit of cooking in the kitchen. It had everything we needed. Most important is that this house has been decorated with attention to detail. It has panache! And, it has wonderful lighting. As I recall, almost every room has skylights. The patios (plural) are comfortable and immediately get you in touch with your surroundings. Scott Wong is your Casa Nova host. He is helpful, flexible, and a really nice person to interact with. I was not ready to leave Casa Nova and am already planning the next trip. The house is simply beautiful! We found that everything you could hope for was included, right down to fireplace starters for the corner fireplace and some staples in the pantry and coffee in the kitchen! We loved the house. The master bedroom is lovely and the sitting room off the MBR was perfect for one person in our party who wakes early and could sit there and read without waking everyone else. The living room is perfect for hanging out and talking, with some warm blankets at the ready since we were there in March and it was a bit cold outside. We thought we would be able to walk to everything since we don't mind walking and a mile does not seem like it is far but we found that the lighting was not great along the back roads off the santa fe trail by the house so we only did that one night after dark and then tried to take an uber but the uber got the directions wrong, he said the map service he uses told him to come in from the opposite direction which was a dead end so be careful if you use uber to be sure they are coming in to the house off the Sante Fe Trail. The directions on the trash pick up were also confusing, no mention of recycling and the plea to use the trash cans marked for the house was hard to do since none were marked. While we were in Santa Fe, we drove to the Bandolier National Park to see the cave dwellings and this was a highlight of our trip. Overall, Santa Fe was amazing and this house was lovely! Santa Fe house with luxurious amenities, views, and an unbeatable location. Casa Nova surpassed our expectations. The property was beautifully maintained, well equipped and aesthetically pleasing. The floor plan is perfect for either a family with adult children or a group of adults. Preparing meals in the kitchen was a joy and it quickly became the perfect spot to snack, visit and make plans for the next day. The major appliances were top quality and we had every tool or small appliance we could use. The office was a nice feature that we did take advantage of, and the internet was excellent throughout the property. Comfy beds; the fluffiest towels and tons and tons of closet space. The wrap around patios were beautiful and we enjoyed the outdoor fire pit. The property opens up to the native brush, and we had visits two nights in a row from a fox! The property is within walking distance of both the square and galleries on Canyon Road. We would definitely rent this property again! To book home with optional 2-bedroom Casita: go to http://www.homeaway.com/vacation-rental/p910740 Additional discount for last minute (20% within 2 weeks), repeat renters (10%) or longer stays (more than 2 weeks). Holidays nights and special event nights add 25% to the regular rate (New Years, Mrkts, T-day and Christmas). One week minimum over Christmas/New Years (12/18-1/3) All licensed Santa Fe Hotels and vacation rentals are required to charge NM State gross receipts tax (8.4375%) and Santa Fe City lodgers tax (7%). Taxes are included in the rental rate, but cleaning and pet fees are extra.